Today we stand united and take the time to honor the 9/11 victims, their families, and the brave heroes who lost their lives at ground zero. The attacks of September 11th were intended to break our spirit. Instead we emerged stronger and more unified. Don't let the shadow of the past hold the future hostage. Let’s not remember the pain; instead let’s recall the strength, courage, bravery and unity we showed on 9/11. Good deeds unite us on 9/11! 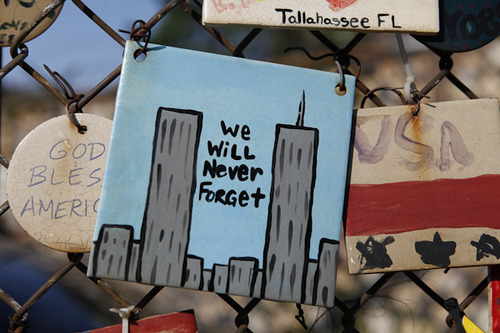 Visit http://www.911day.org/ and express your support for this inspiring observance. Later, when you have determined what your plans will be (either as a group or individually), return to the site and share your plans with others. When you’ve completed your activity, consider posting photos and information on your Facebook page, and through Twitter (use the hashtag #911day or #Iwill). Consider planning a good deed, volunteer or charitable service project. There are countless things you can all do together to help, and a service project is a great way to teach others about the importance of setting aside time to help others in your community.